Derry City won a five-goal thriller, against Finn Harps in an action-packed derby game at the Brandywell. City, who have now gone eight games unbeaten, took the lead in the nineteenth minute when defender Declan Boyle unwittingly steered the ball into his own net after Ciaran Martyn's shot had cannoned off goalkeeper Gavin Cullen. The home side doubled their advantage eight minutes later when Mark Farren fired a low angled right foot shot into the net. 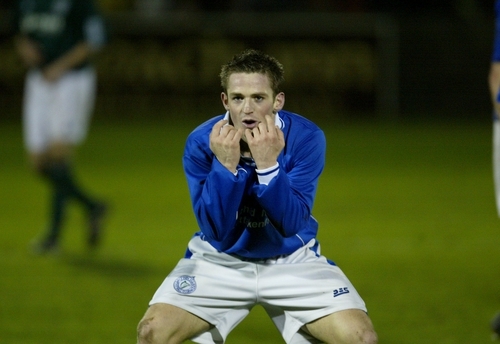 However Harps reduced the arrears in the thirtieth minute when Kevin McHugh dispossessed Kevin Deery before hammered a right foot rising shot off the underside of the crossbar into the net from twenty yards. Derry restored their two-goal advantage two minutes into the second half when, following a surging run by Ciaran Martyn, Killian Brennan rifled a right foot shot past 'keeper Cullen from just inside the penalty area. McHugh, with his second goal of the game, closed the gap to just one goal in the fifty-sixth minute when he side footed Jonathan Minnock's low left wing cross into the net. The rivalry between these two North-West teams was underlined just thirty minutes before kick-off when match referee Pat Whelan from Dublin, following a verbal exchange with Felix Healy, ruled that the Harps' team boss should watch the game from the stands rather from the dug out. Derry City: Forde, Hargan, Hutton, Delaney, Higgins (Doherty 58 mins), Martyn, Beckett (Murphy 80 mins), Brennan, Deery, Farren, Cash (McGlynn 68). Finn Harps: Cullen, Asokuh, Minnock, Boyle, Stolcock (McGowan 65), Lauchlin (Bonner 75), Capper, McGrenaghan, Breen, McHugh, Gorman.